Editor’s Note: Adjunct professors now make up half of all college faculties, and 76 percent of instructional positions are filled on a contingent basis, according to the American Association of University Professors’ annual report on the “economic status of the profession.” There’s no starker way to consider adjuncts’ economic status than to hear that they’re paid an average of $2,000-$3,000 per class, with few to no benefits. At SUNY New Paltz, for example, between 1979 and 2008, adjunct pay has fallen 49 percent, while salaries for college presidents have increased 35 percent. The plight of adjuncts — what we’re calling “adjunctivitis” — is the subject of our upcoming Making Sense report. One of the adjuncts in the broadcast segment is Arik Greenberg, who teaches theology at Loyola Marymount University. He’s been active in the movement to unionize adjuncts and, at the invitation of the Service Employees International Union and the New Faculty Majority Foundation, recently took his case to the Rayburn building in Washington, DC, where he briefed congressional staffers on the working conditions of these part-time faculty. We wanted to share some adjuncts’ more personal struggles with our readers, and Greenberg was willing to adapt his testimony for the Making Sense page. 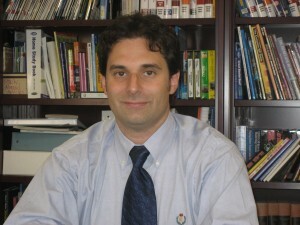 Arik Greenberg: I am an adjunct professor of theology at Loyola Marymount University, a major, private U.S. university. I have worked there for over 11 years, teaching consistently almost every semester. Despite the fact that I have the same credentials as my tenured colleagues, there is no opportunity for advancement. There are no full-time tenure-line positions that have opened or been established in my particular discipline at LMU for many years. However, they always seem to have more than enough classes that need to be taught in those very same disciplines, so they hire numerous part-timers to teach them. Arik Greenberg teaches at Loyola Marymount University. As adjunct faculty members, we receive no benefits of any sort. I have never received a merit-based raise or a “promotion” (whatever that is), only the occasional cost-of-living adjustments that everyone else at LMU receives every few years. I have no job security, no assurance of academic freedom, no dedicated office space other than a small designated room that I share with four to five other adjuncts. I am also institutionally ineligible for the grants and professional development monies that tenure-line faculty have access to. Working numerous jobs, some in the classroom and some in other segments of higher education, such as consulting and low level administrative work for small startup colleges, I have no time to contribute to research and publication in my chosen field. While I have done my best to publish, that part of my dossier is underdeveloped compared to others who hold tenure-line jobs. Their positions allow them to devote time to this; they are paid to do so. But when I should be researching and writing, I have to drive to another job. It has been this way with me for years. So even if a tenure-line job were to arise that I am eligible for, that gap in my dossier would hold me back, even though I have over a decade of highly successful teaching experience. And even though I give my all to my teaching, my ability to grade and prepare for classes in a timely manner is hindered by the fact that I have to rush to another job. I could be offering more office hours or spending more time developing more effective courses and teaching methods. Almost immediately after I first began teaching at my school, they hired me for a short-term “visiting” position, which was full-time, non-tenure track. But after two years of this full-time position, they deliberately let my contract lapse so that they would not be in danger of my suing them for tenure — a risk that universities face when employing a short-term contract employee for several consecutive years in a full-time position. This is common practice at our school and elsewhere. But there was no evidence of my incompetence or lack of excellence in teaching. I had rave reviews from all my students and had wonderful relationships with all my colleagues, several of whom supported my candidacy for a full-time, tenure-track position. In fact, as evidence of my demonstrated prowess, after a short while they brought me back as a part-timer, and I have been employed there every semester since as an adjunct lecturer. I’m good enough to teach their students every semester for many years, but I’m not good enough to hire permanently? After taking out nearly $140,000 in student loans to pay for grad school, and after years of financial hardship deferments, accrued interest has brought these loans to over $190,000. And on an adjunct lecturer’s salary, even augmented with other side jobs, I can neither support my family nor pay my student loans. My wife and I cannot afford to raise a child on our combined income, so we have waited to raise a family. Now at the age of 43, it may be too late. And when my parents became ill, I couldn’t afford to move them in with me, arrange proper medical care or take enough family leave to be at my father’s side when he died. With the massive debts that my parents have left me, I risk losing the family home that I grew up in — that my grandfather built for us with his own hands — all because I am living on part-time wages. Now that my parents are gone, I want to honor them by helping to change academia for the better. University administrations have failed to safeguard their hallowed halls against greed and the service of short-term savings, going the way of big business. And the accrediting bodies have failed to guide and censure them as well. If this situation continues unchecked, it will signal the destruction and disintegration of higher education as we know it, though many tenured faculty still do not recognize the inevitable, morbid outcome if this current trend is not immediately reversed. I have no intention of letting that happen. My father was a grade school teacher. And he used to say that if not for the unions, teachers would have starved. Now, as an adjunct, I am experiencing what it would have been like for grade school teachers to be unsupported by the unions. There is a growing movement of adjuncts who are willing to stand together to stem the tide of the avalanche. So when the union came to our campus in the fall of 2013, I took out my lucky pen and asked, “Where do I sign?” Our grassroots movement will prove to be the best thing that happened to higher education since the advent of the erstwhile tenure model, despite the common public opinion about unions fostering greed and mediocrity. I’m fully educated; I stayed in school. Two masters and a Ph.D. I’ve published a book. I’ve paid my dues. I’ve followed the rules to realize the American dream, but I am now living the American nightmare. And I am not alone in this. I’m ready to work. All I want to do is contribute to the scholarship in my field and to teach my students effectively and passionately. But I need to earn a decent wage in order to do so. Left: Being an adjunct isn’t what most part-time university faculty had in mind when they envisioned being a professor. Photo by Cultura/Frank and Helena via Getty Images.